One of my favorite–yet least mentioned–free utilities is Growl, a universal notification service for Mac that lets applications notify you of events. Now instead of each application deciding on how they want to present notifications for things like new mail, incoming tweets, etc. you can control it in a single place, assuming the application supports Growl or an extension has been written for it. Such is the case with Mail.app. 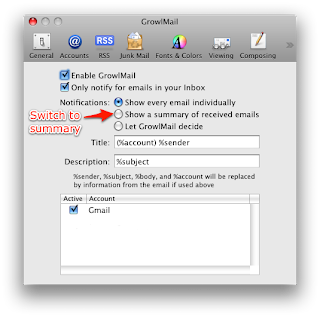 Though Mail.app is not written to support Growl the developers for Growl have created an "extra" that can provide that functionality. I've been using this setup for a while now and have been quite pleased with it. This will change the setting for you and allow you to load up Mail.app. The downside to this is if you still want individual mail message notifications. For that you can use Solution 2. There is a beta version of Growl that addresses this issue; you can grab it from the Growl beta page. 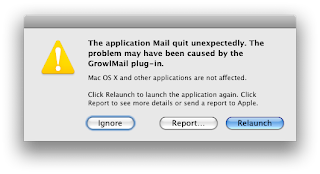 Just download the DMG and install the latest Growl package AND the newer Mail.app extension (in the Extra folder). This is of course beta software but I've been running it for a while on two of my Macs and it's been running fine so far. If you have any work-arounds on this please drop a note in the comments. I was able to find most of this information but it was a bit scattered. Hopefully people searching when they get the error will find this helpful. @Aleksander: Keep in mind it is beta software. Not sure when they are planning on officially releasing it. And now I know why I don't use Growl, though my wife does. I admit she enjoys the fact that she can set one app to tell her when anything happens, but I like it better when I set the individual apps to send me alerts. It's not that hard to give each app a different alert sound and it reduces the risk of internal software conflicts. @Vulpine: Personally I think this should be a service of the OS rather than require an add-on. Then at least the APIs would be standardized and (hopefully) universally respected. where'd you go Dave? taking a month long vacation? @Charlie: Sort of. I've been taking a break from blogging lately and focused on a pretty major re-write for www.sharedstatus.com. I'll be starting up again pretty soon though. Glad to hear that! I was beginning to worry something was wrong... I've loved following this blog since its start (March '08 convert here) and I've learned a ton from it. Good luck with your re-write!